Mary Jo Sollars, 89, of Yorktown, passed away on Thursday morning, September 20, 2018 at Community Hospital of Anderson. Mary Jo was born September 22, 1928 to the late Benjamin Newton and Eva Marie (Wood) Hart. She graduated from Muncie Central High School and earned her associates degree from Indiana Business College. Mary Jo worked at Ball Memorial Hospital for many years before her retirement in 1990. 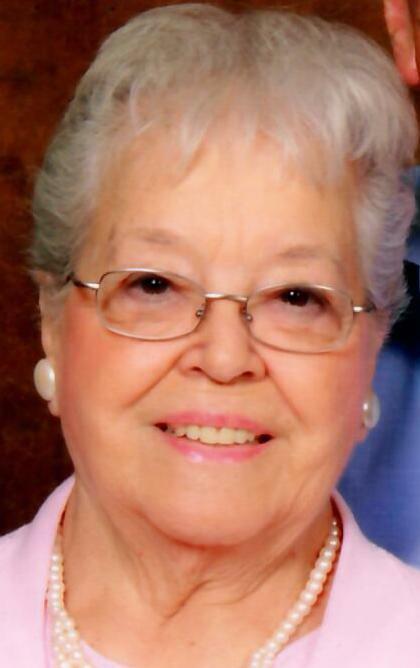 She was a member of the Cammack United Methodist Church and was a volunteer at the Yorktown Public Library. Mary Jo enjoyed crafts, bowling, euchre, and traveling. Mary Jo is survived by two children, Dale Stephenson (wife Judi) of Texas and Patti Osborne of Florida; four grandchildren, Tonia Wainscott (husband Jim) of Indiana; Michelle Jones (husband Shannon) of Kentucky, David Stephenson (wife Angie) of Indiana, and Amber Stephenson of Georgia; four great-grandchildren, Austin Stephenson, Bailey Coleman, Abby Wainscott, and Ashlynn Wainscott; a sister, Margaret Stephenson; and several nieces and nephews. Mary Jo was preceded in death by her husband of 47 years; and 12 siblings. A funeral service to celebrate Mary Jo’s life will be held at 12noon on Saturday, September 22, 2018 at Cammack United Methodist Church, 1901 N. Cammack St., Muncie, IN 47304. Pastor Jerry Thomas will officiate. Burial will follow in Jones Cemetery. Friends and family may gather to share and remember from 10:00 A.M. until 12:00 P.M. Saturday at the Cammack United Methodist Church. Memorial contributions may be given to the Yorktown Public Library, 8920 W. Adaline St., Yorktown, IN 47396. The Gant and Miller families are honored to celebrate Mary Jo’s life with her family and community.